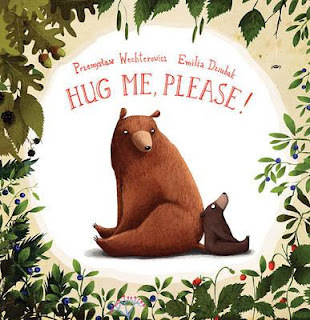 Kids' Book Review: Review: Hug Me, Please! Little Bear and Daddy Bear know all about hugs. They know that hugs can brighten up your day, calm you, and make you feel good. In Hug Me, Please! Little Bear and Daddy Bear set out to find some honey. It leaves them with such a warm and sweet feeling they decide to spend the day sharing that feeling with others by giving out hugs. First on the bears' list for a hug is Mr Beaver. He is soon followed by Miss Weasel and a host of other creatures including hares, a wolf, elk, and even an anaconda! The bears have a wonderful, heart-warming day, but they seem to have forgotten something, or more to the point, someone. They've forgotten to give each other a hug! Hug Me, Please! is the brainchild of two Polish creators, author Przemystaw Wechterowicz and illustrator Emilia Dziubak. I've not encountered them before, but I am definitely going to look for more of their work. The story is a simple one, sharing a message of friendship and openness. The illustrations are genuinely cute and slightly humourous. I especially recommend you look out for the bears dancing to get attention, and the very expressive eyes of the various characters. Hug Me, Please! would make a great bedtime or special occasion story, but it's also likely to be one that you and your children will want to read any other time, and over and over again. Expect to find something new each time you do.